HADOUKEN!!! We're returning to fight M.Bison's forces of Shadaloo with our second Street Fighter II Championship! You're invited to take part in a 60 person double elimination competition in the Netherworld on Sunday the 2nd of September. We'll be exclusively competing on Street Fighter II: Hyper Fighting. 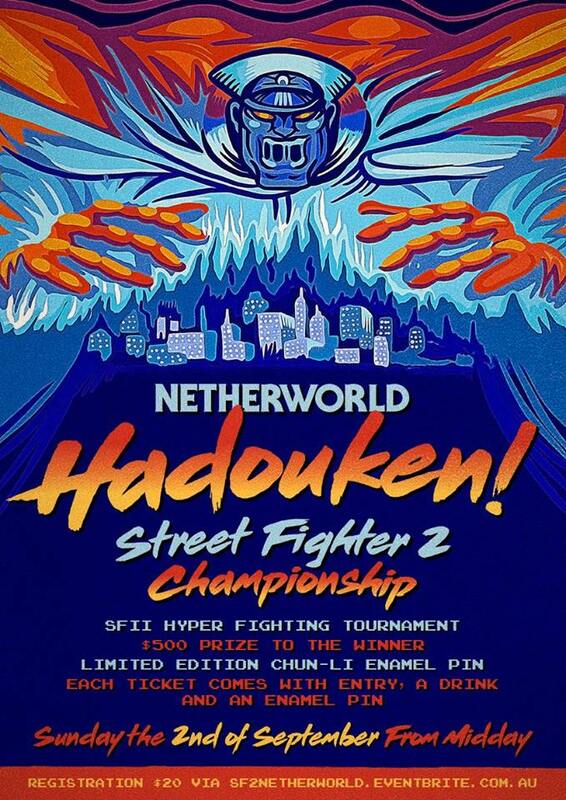 Registration is $20 via SF2Netherworld.eventbrite.com.au which comes with a drink, a limited Chun-Li enamel pin designed by Moonshine Madness and entry into the comp. The winner will walk away with $500! All fights will be on SFII: Hyper Fighting cabinets. All cabs and controls will be freshly serviced and tested before the competition. There will be two qualifying brackets - one at 12.30 and one at 2.30pm. You can sign up for either bracket when grabbing your ticket (first in, best dressed) though everyone will need to sign in by 12.30pm on the day. -Maxiumum 30 persons per bracket. -All matches are best of 3 matches (so potentially up to 9 fights). -The top 6 (12 total) from each bracket will make it to the finals that will happen between 4pm and 5pm. If you haven't got a ticket, you're more than welcome to still join us and witness Shoryukens for days!